New Delhi, February 17: A day after Congress President Rahul Gandhi raised concerns around 'Make in India' initiative after Vande Bharat train experienced trouble during its initial run, Railway Minister Piyush Goyal hit back saying the Congress leader has insulted India’s intelligence and hardwork by mocking the programme. "It is very unfortunate that he has attacked a flagship programme that doesn’t belong to a political party, but to the people of India," Goyal told ANI. "It is all about Indian technical knowledge, the efforts that our workers do to produce goods in India. I feel sorry that Rahul Gandhi hasn’t recognised that for the first time India has indigenously developed a transit which barely a few countries in the world made," Goyal added. Vande Bharat Express, earlier known as Train 18, broke down on Saturday morning at the Chamraula station in Uttar Pradesh, some 194 km from the national capital. 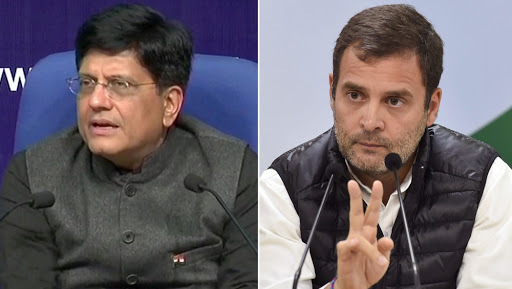 In a Facebook post on Sunday, Goyal further said Gandhi has “insulted” India’s intelligence and the hardworking engineers of railways who have put in backbreaking effort to build the country’s first indigenous semi-high speed train, the Vande Bharat Express. “Somebody who was unable to explain why Engineers Day is celebrated, he insulted the hardworking engineers of railways who have put in backbreaking effort to build India’s first indigenous semi-high speed train, the Vande Bharat Express. Rather than encouraging them, he has taunted them,” he said. “Vande Bharat Express is developed and designed in India whereas earlier designs (ICF, LHB) were imported. It costs less than half of the cost to import a similar train. It has set the highest standards in Railways & is already fully booked for the next two weeks,” he said.